The Azure Messaging team is continually working to enhance the resiliency and availability of our service offerings – Azure Service Bus, Azure Event Hubs, and Azure Event Grid. As part of this effort, in June 2018, we previewed Azure Service Bus Premium tier for Availability Zones and Azure Event Hubs Standard tier in 3 regions – Central US, East US 2, and France Central. Availability Zones is a high availability offering by Azure that protects applications and data from datacenter failures. Availability Zones are unique physical locations within an Azure region. Each zone is made up of one or more datacenters equipped with independent power, cooling, and networking. To ensure resiliency, there’s a minimum of three separate zones in all enabled regions. The physical separation of Availability Zones within a region protects applications and data from datacenter failures. Zone-redundant services replicate your applications and data across Availability Zones to protect from single-points-of-failure. With this, Azure Service Bus Premium and Azure Event Hubs Standard are generally available for Availability Zones, and Azure Event Hubs Standard in every Azure region that has zone redundant datacenters. How do you enable Availability Zones on your Azure Service Bus Premium namespace or Azure Event Hubs Standard? 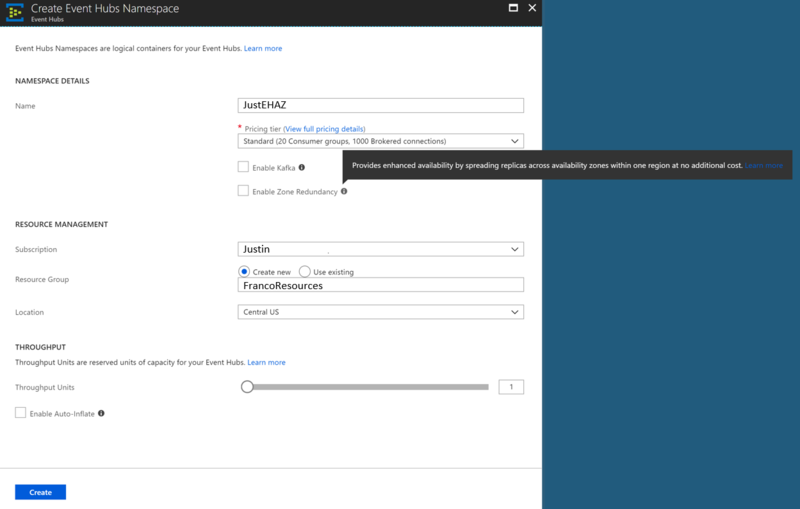 You can enable Availability Zones on new namespaces only. Migration of existing namespaces is not supported. If using an ARM template to create a Service Bus Premium namespace, it is as simple as specifying an AZ supported region and setting the zoneRedundant property to true in the template. 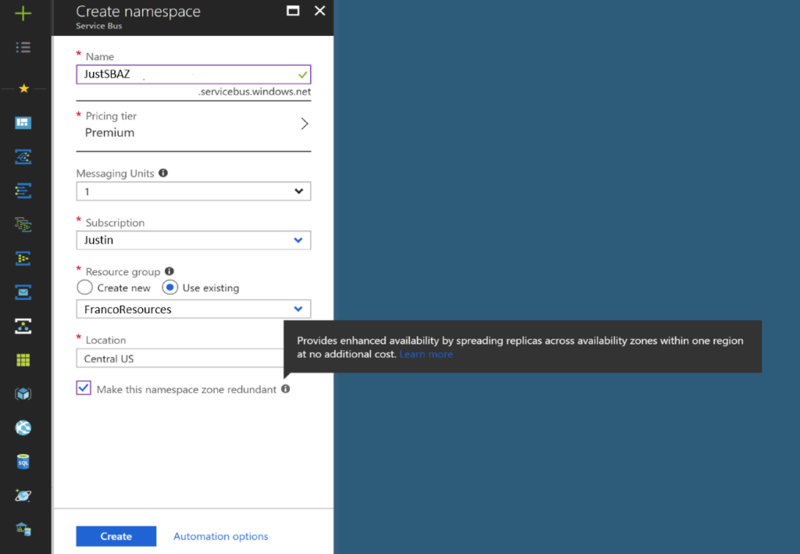 You can also enable zone-redundancy by creating a new namespace in the Azure portal as shown below. It is important to note that you cannot disable zone redundancy after enabling it on your namespace. Built on the successful and reliable foundation of Azure Service Bus messaging, we introduced Azure Service Bus Premium in 2015. The Premium tier allows our customers to provision dedicated resources for the Azure Service Bus namespace so that they can ensure greater predictability and performance for the most demanding workloads paired with an equally predictable pricing model. With Service Bus Premium Messaging, our customers benefit from the economics and operational flexibility of a multi-tenant public cloud system, while getting single-tenant reliability and predictability. Azure Service Bus Premium also provides access to advanced enterprise features such as Availability Zones, Geo-Disaster recovery, and Virtual Network Service Endpoints along with Firewall rules. These additional features make the Premium tier tremendously valuable for customers looking for a highly reliable, resilient, and secure enterprise messaging solution. What are Availability Zones in Azure?